One of the biggest breakthroughs in the past 40 years for deep-sky enthusiasts has been the introduction of effective multi-layer interference filters for certain classes of deep-sky objects. With filters, objects which might ordinarily be difficult to impossible to see in most amateur telescopes even under dark sky conditions come within range of the experienced observer. Even those bright and easy “showpiece” nebulae often gain significant detail and contrast with proper filtration. Some filters even allow urban or suburban observers to view certain objects under less than pristinely dark skies by reducing the background glow of the night sky. Since they were introduced in the late 1970’s, these filters have become a vital part of the amateur’s “observing arsenal”. 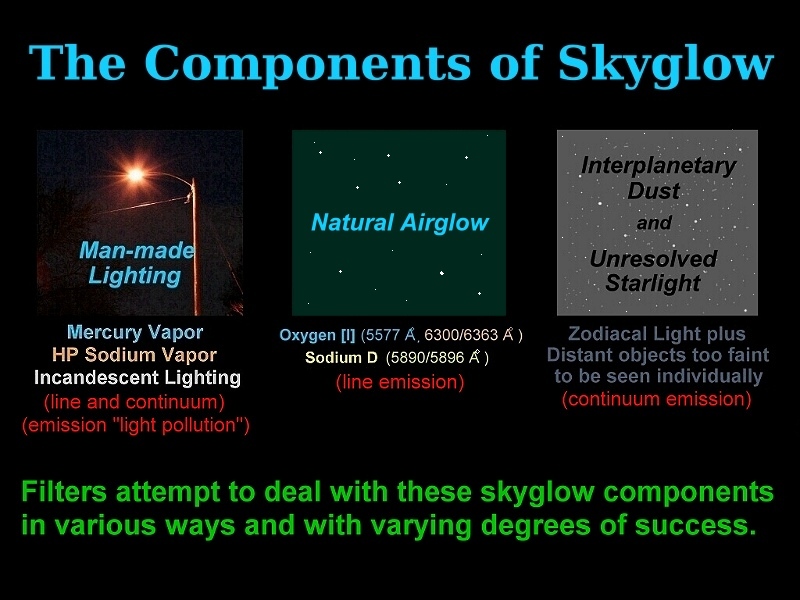 While many amateurs consider the term “skyglow” to mean man-made light pollution, there are actually several components that go into it (including some that are present even well away from man-made lighting). There are a number of different filters available on the market today for improving the views of various Deep-Sky objects, with most coming in one of three classes: 1. Broad-Band “light pollution” filters, 2. Narrow-Band “Nebula” filters, and 3: Line filters. The broad-band “Light-pollution Reduction (LPR) filters are designed to improve the visibility of a variety of Deep-Sky objects by blocking out the common Mercury vapor, Sodium, and some other emission lines from man-made or natural sources which contribute to light pollution, while letting through a broad range of other more useful wavelengths. Since the eye is mainly a “contrast detector”, this selective screening out of some of the background skyglow increases the contrast and helps Deep-sky objects stand out more noticeably. 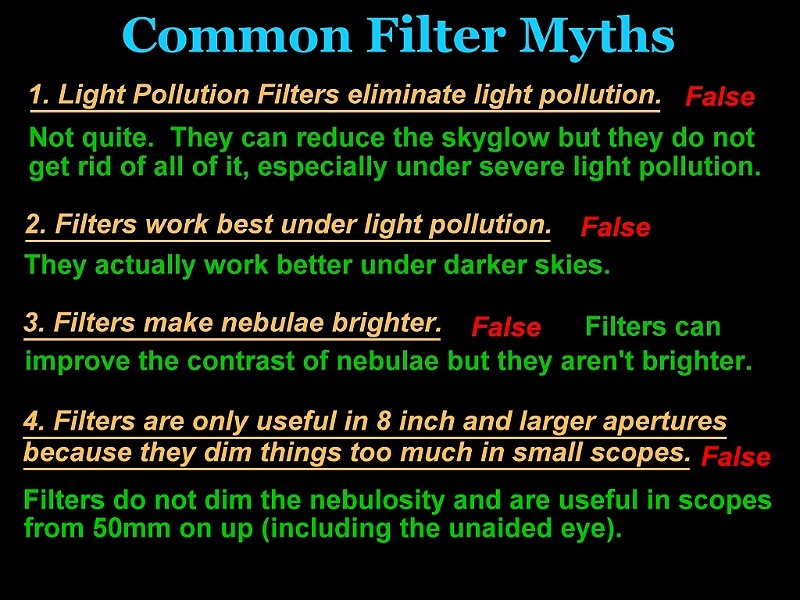 While these broad-band filters do not eliminate the effects of light pollution or make the objects brighter, in many cases, these filters can improve the visibility of some deep-sky objects to at least some degree. 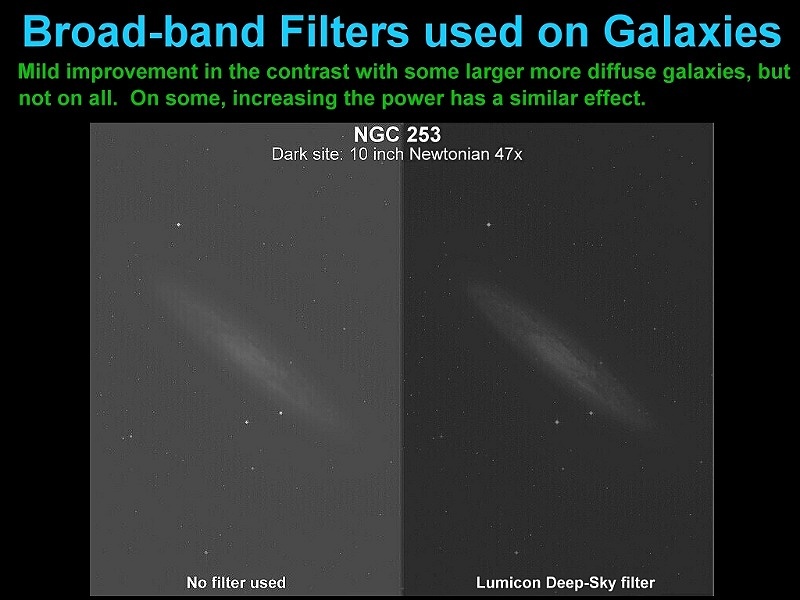 The greatest improvement in the overall view is often found with emission nebulae, but broadband filters can also give a slight contrast boost to some reflection nebulae and a few of the larger more diffuse galaxies under mild skyglow or dark-sky conditions. In addition, larger versions of these broadband filters which fit over camera lenses can be somewhat useful for photography of wide star fields when some skyglow is present. look fainter from a dark sky site when using a broad-band filter than without one. Severe levels of light pollution may also be too much for the broad-band filters to handle effectively, so you still want to find as dark an observing site as you can and use averted vision. The broadband filter has an additional bonus, as it does work fairly well as a blue filter for observing Jupiter and for bringing out the white clouds and polar caps of Mars. In summary, the broad band “light pollution” filter can be somewhat useful in compensating for some light pollution, but may not be the most impressive filter intended for deep-sky use. Narrow-band “Nebula” filters, as the name implies, are mainly designed for viewing many emission nebulae. These filters allow only the bright pair of nebular emission lines of Oxygen III (4959 angstroms and 5007 angstroms wavelength), the Hydrogen Beta emission line (4861 angstroms), and wavelengths between H-beta and the OIII lines to get through. Narrow-band filters darken the background skyglow significantly without hurting the nebula, and are often of considerable help when observing in mild to moderate light pollution. 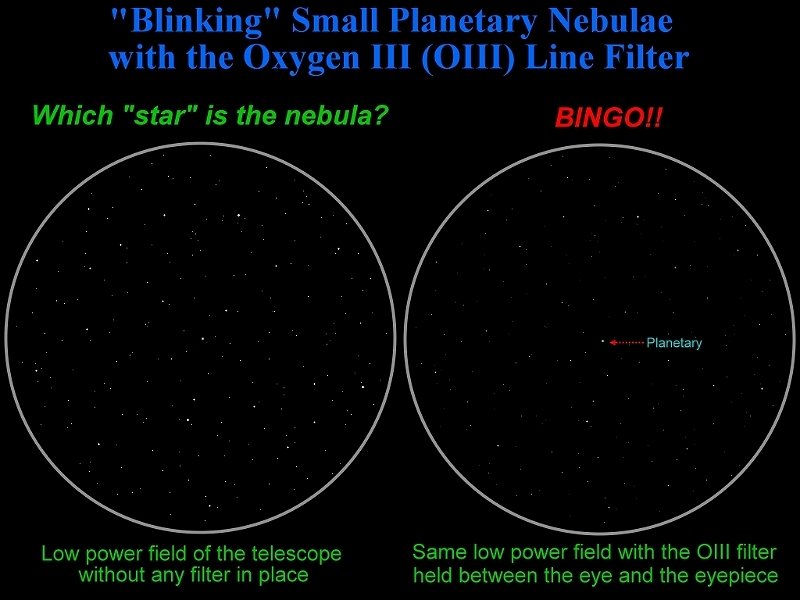 The filter’s improvement of the view of emission nebulae is usually superior to that of the broadband filters, as many faint nebular objects become much easier to see (without the filter, some may not be visible at all!). Even the more prominent nebulae which are visible without filters gain considerable detail and contrast with the narrow band units. However, these narrower filters require the use proper dark adaptation and averted vision for decent results. In addition, low to moderate powers (3.6x per inch to 9.9x per inch of aperture) can often be somewhat more effective for filter use, especially for the larger and more diffuse emission nebulae, although considerably higher magnifications can be used successfully once the observer has gained more observational experience. These filters will, for example, often show the Rosette Nebula TO THE UNAIDED EYE when you look through them from a dark sky site. 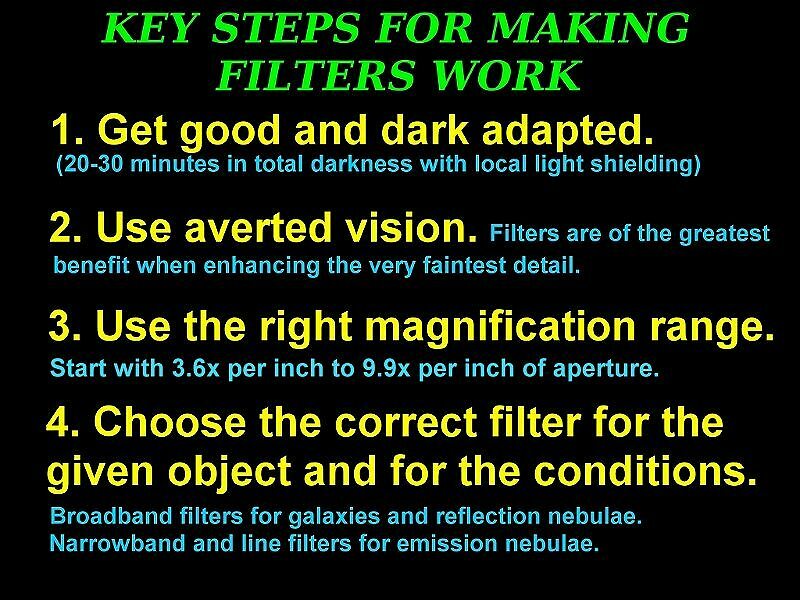 Indeed, under a really dark sky, the contrast and detail improvements provided by a narrow-band filter can be even more impressive than under a light-polluted sky, so most observers continue to use their filters at such dark-sky sites. Some available narrow-band filters are the Lumicon UHC, Astronomik UHC, DGM Optics NPB, Meade Series 4000 Narrowband, Thousand Oaks Narrowband LP-2, and the Orion Ultrablock. The NPB, and Meade Narrowband also have a deep-red passband for the Hydrogen Alpha line. This feature may sometimes help bring out faint red colors in the very brightest emission nebulae when used in large telescopes and with observers that already have a lot of red sensitivity with their eyes. 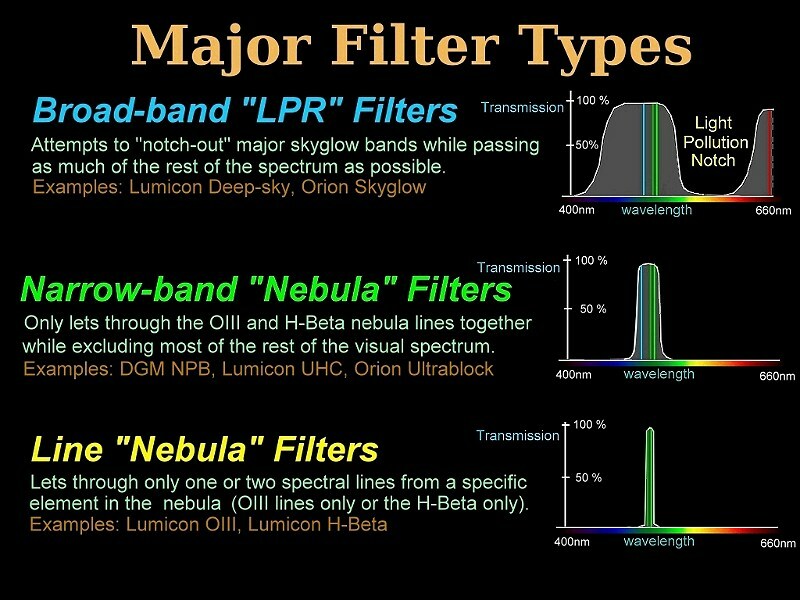 In comparison, the various narrowband nebula filters mentioned above have very similar characteristics, although the Lumicon UHC has a slightly higher light transmission factor in its primary passband than the Ultrablock, which may be helpful for viewing faint nebulae. At times the Ultrablock has also been slightly less expensive than the UHC, but when not sale priced, the two filters are of similar cost. Many of these narrowband filters will perform quite well, and the overall difference between them can be very slight. However, these “nebula” filters usually slightly reduce the brightness of most star clusters, reflection nebulae, and galaxies, although in moderate light pollution, a narrow-band filter may still be of some use on these objects with larger apertures. Photographic use of these narrow band filters is also not recommended. There are some filter manufacturers that have appropriated the “UHC” label from Lumicon without permission and put it on filters that are a little too broad to be considered narrow-band nebula filters. Examples of these “false UHC” filters include the Astronomik UHC-E, Baader UHC-S, and the Celestron UHC-LPR, so these should be avoided unless you just want a filter that is really just a broad-band LPR unit. Line Filters are very narrow passband specialty units which are designed to let in only one or two spectral lines from emission nebulae, such as the close pair of Oxygen III lines or the Hydrogen-Beta line. In the line filter category, the Oxygen III (OIII) filter is the real standout. Its very narrow bandwidth allows only the pair of emission lines of Oxygen to get to the eye, and for many planetary and some diffuse emission nebulae, the boost in contrast has to be seen to be believed! The Veil and Helix Nebulae look like photographs in a 10″ with the OIII filter, and some of the “green box” emission nebulae in SKY ATLAS 2000.0 jump out at you. You may even see some nebulae which are not shown on some atlases. One neat trick for finding tiny planetary nebulae using nebula filters is to “blink” the objects by holding a narrow-band filter between the eyepiece and the eye. The stars in the field will dim somewhat, but the planetary nebula will remain undimmed, thus standing out from the background stars. The OIII filter is often the best one for use on many planetary nebulae, with the “blinking” technique becoming vastly more effective, as the stars nearly vanish, leaving the planetary standing out like a sore thumb. However, since the bandwidth of the OIII filter is so narrow, it may hurt some nebulae with significant H-beta emission somewhat, like the nebulae around Gamma Cygni or the Horsehead. This is one reason why experienced observers often have *both* a narrow-band nebula filter *and* an OIII line filter to cover all the bases. 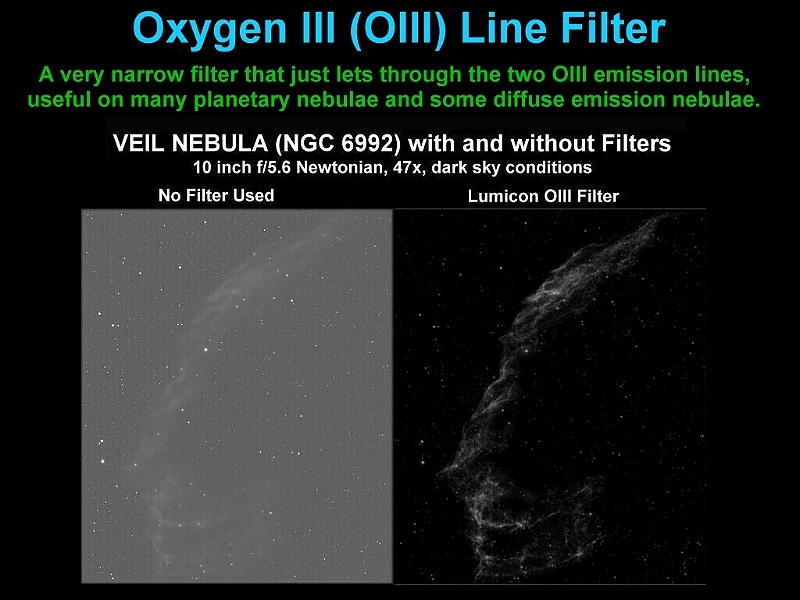 Differences between the OIII filter and narrow-band filters like the Lumicon UHC are mainly in nebula visibility and contrast. Many nebulae show a slightly larger area of nebulosity in the UHC filter with slightly higher brightness, but in the OIII filter, they will often have more contrast and dark detail. However, the OIII filter really dims the view of star clusters and galaxies even more than the narrow band filters do, although observers with large telescopes may find the OIII useful for bringing out a few emission nebulae in other galaxies, like the HII regions in M33. In addition, for the larger more diffuse objects, a selection of a fairly low magnification (3.5x per inch to 7x per inch of aperture) is sometimes helpful in initially viewing them with the OIII filter. On smaller planetary nebulae that have high surface brightness however, the OIII can sometimes be successfully used to bring out some inner detail at powers up to around 50x per inch of aperture. Thousand Oaks has produced its own Oxygen III filter (the “OIII LP-3 filter”), as has Astronomik, Meade, Orion, and a number of other outlets. Baader’s OIII filter has a very very narrow passband width which has tended to cut into the 4959 angstrom OIII emission line a bit, although many amateurs still report good results with that filter. Another somewhat less-used line filter is the H-Beta filter. As the name indicates, the filter only lets through the H-Beta emission line of Hydrogen, and is best known for its effect on the Horsehead Nebula, the California Nebula, the Coccoon Nebula, and a number of other rather faint objects. On an 8″ to 10″ scope, the Horsehead Nebula goes from near invisibility to visibility, and the California Nebula becomes fairly easy, gaining a great deal of contrast and filamentary detail. Again, for the larger and more diffuse objects, lower magnification can often prove more effective when using the H-Beta filter. An improvement over non-filter use for additional objects like M42/43, the North America Nebula, and a few others can also be noted, but in many cases, these other objects can appear somewhat better overall in the Narrow-band or OIII line filters. The H-beta can also be used to observe some of the structural details of some brighter nebulae by comparing the H-beta view with that in other filters. However, the H-beta does not usually work well on most planetary nebulae, as it nearly wipes out some of them and greatly dims most of the rest. The total number of emission nebulae which the H-beta will significantly improve is smaller than with the narrow-band and OIII line filters, but it is considerably more than the three or four that some sources cite for the filter. 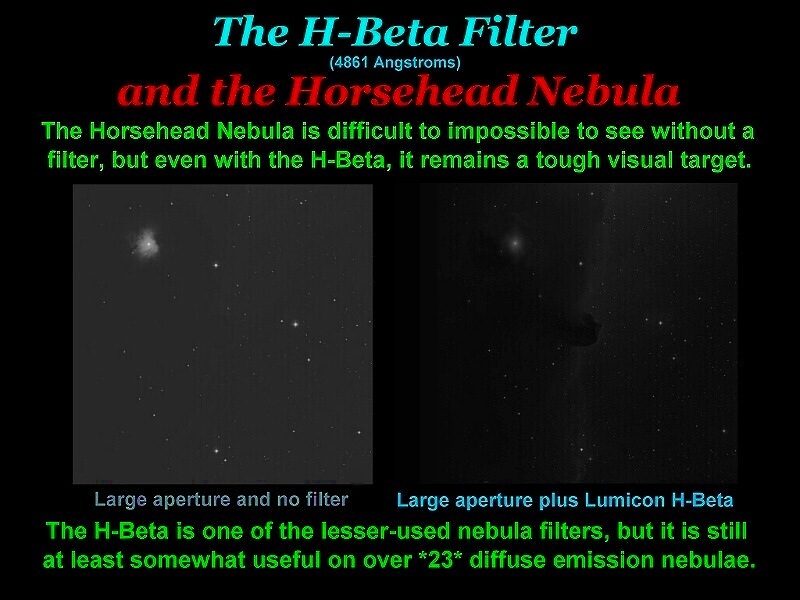 Many of these “H-beta” objects tend to be fairly faint to begin with (like the Horsehead) and require larger apertures for decent views even with the filter. Unless you really like looking at these faint H-beta targets, you may be able to do without the H-Beta filter, at least initially. Thousand Oaks also makes an H-Beta (LP-4) as does Astronomik. 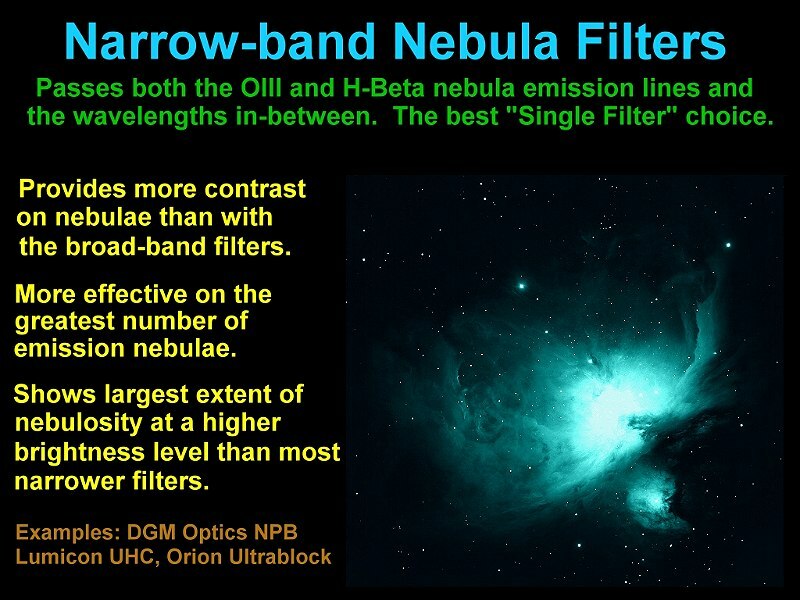 For recommendations, if you can afford only one filter, get a narrowband filter like the DGM NPB, Lumicon UHC, Thousand Oaks Narrowband LP-2, or Orion Ultrablock (whichever is least expensive at the time). If you can afford to get two filters, the OIII makes an excellent companion filter to a narrowband one but remember to use them with an eye that is properly dark adapted and employ averted vision. Filters won’t make the objects brighter, but in many cases, they can make many of them a lot easier to see. Have fun!